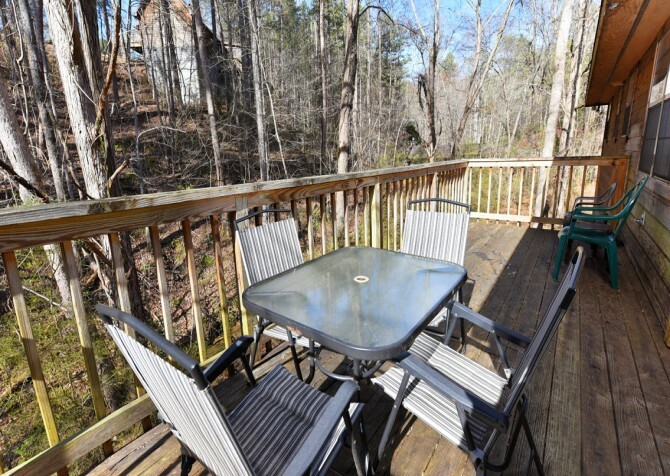 Mountain Blessing is a one bedroom cabin rental that offers wooded views. Choosing this cabin rental for your next vacation would be ideal if you’re traveling as a couple, a small family, or a group of friends. Sleeping up to four guests, this cabin provides a cozy and inviting atmosphere. With many amenities to enjoy, this cabin also comes with two parking spaces. 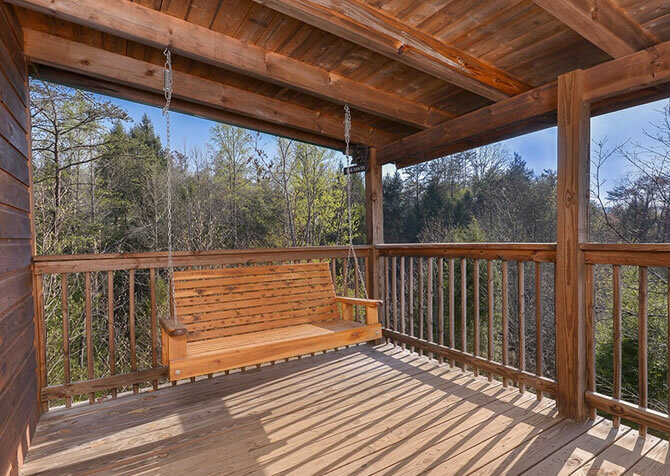 Take one step into this cabin and you will begin your dream vacation. 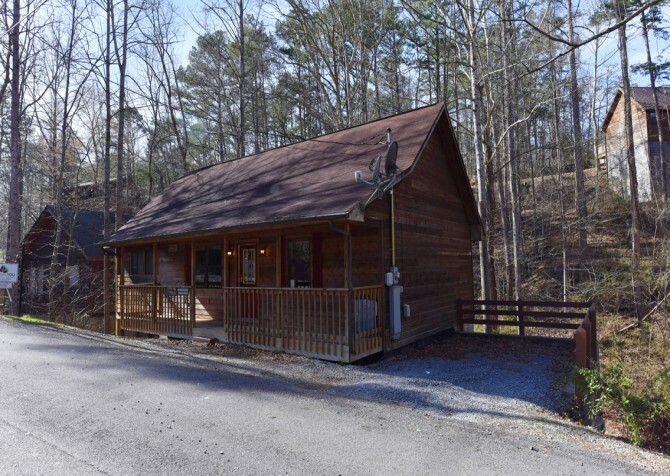 Not only is this cabin easy to access, but the surrounding area is nice and peaceful. Even though you have neighbors next door, this cabin still feels like it is away in the woods. This Pigeon Forge cabin rental offers a spacious one bedroom with a king size bed. 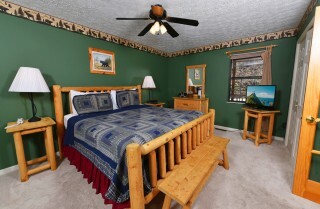 The bedding is inviting and colorful. There are two bedside tables that both have lamps to provide extra lighting. This room is decorated with idyllic Smoky Mountain décor. 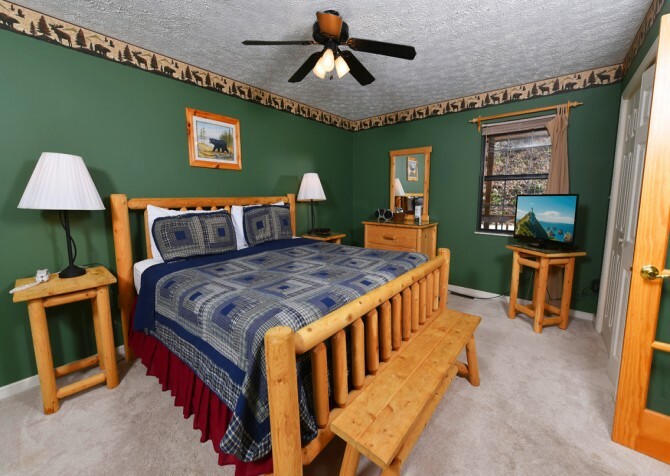 The bed frame is wood, adding a rustic look, while the walls are painted a soothing green. With a jetted tub inside of the bedroom, you will not need to try very hard in order to relax at Mountain Blessing. 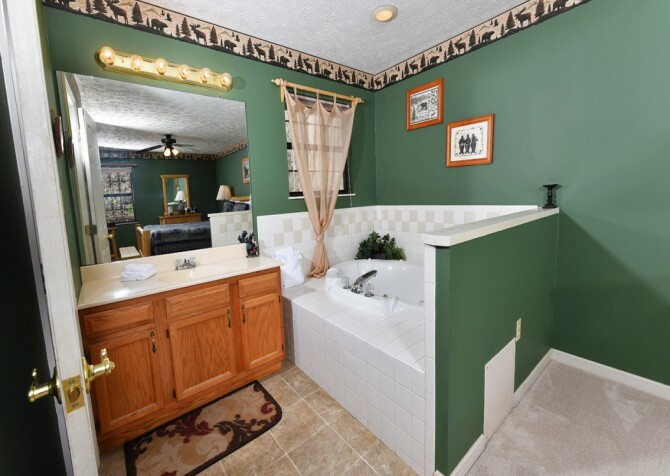 One bathroom can be found attached to this bedroom. This master suite is the ideal place to relax while you vacation. 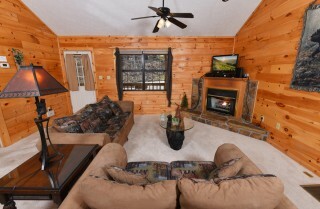 The living room has two soft sofas that have matching throw pillows. Sit, relax, or lie down and take a nap! 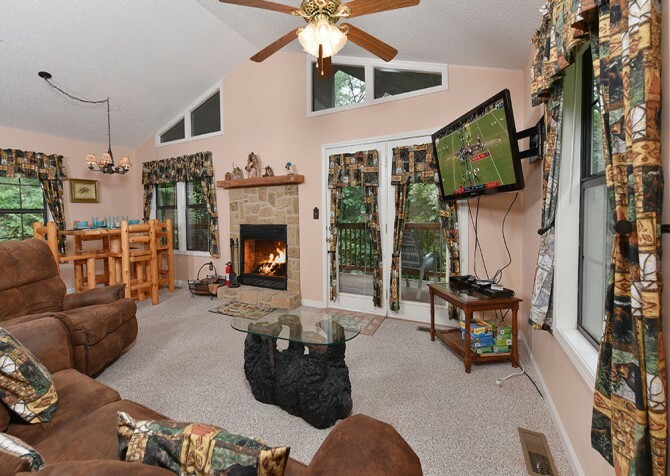 Gather the family to watch a movie or spend an evening in alone. With the gas fireplace and wood-paneled walls, this living room has an overall cozy feel. 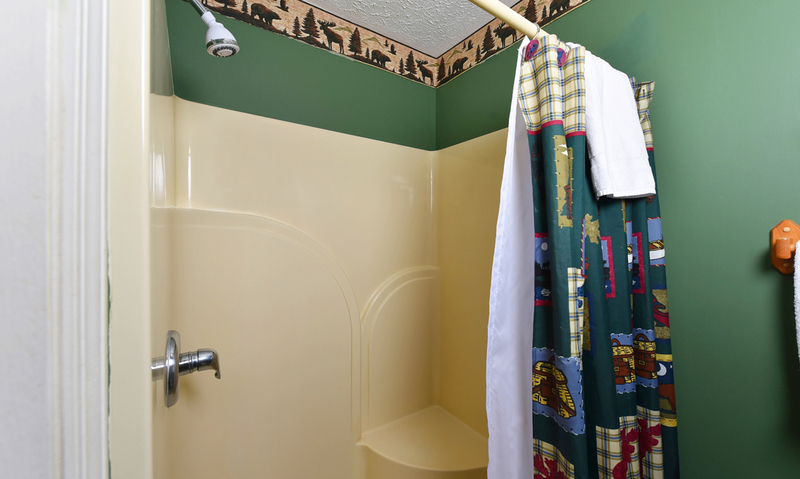 Enjoy the unique bear décor around the room. The sunlight coming in from the windows in the dining area makes the room very bright and fresh during the day. 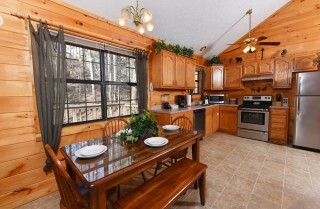 The kitchen in this cabin rental has an open floor plan and offers plenty of counter space for meal preparation. Mountain Blessing boasts hardwood cabinetry and wood paneling on the kitchen walls. 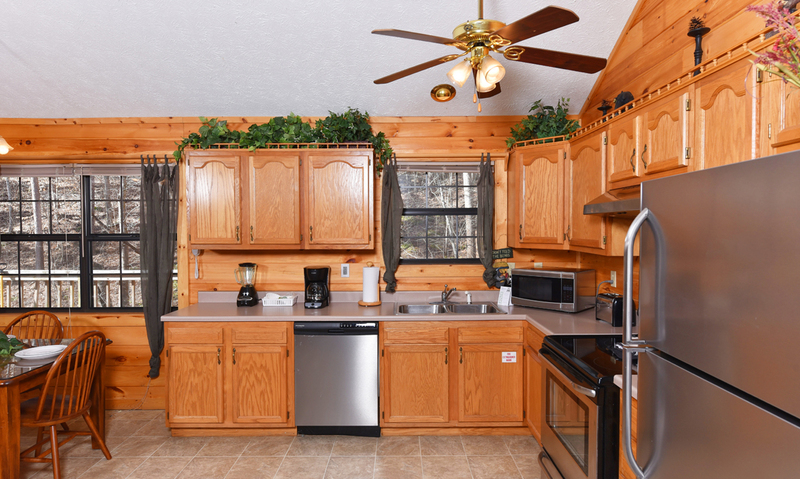 There is a window located above the sink that allows you to see your wooded view while you wash dishes and cook. Enjoy this beautiful kitchen while you utilize all it has to offer. 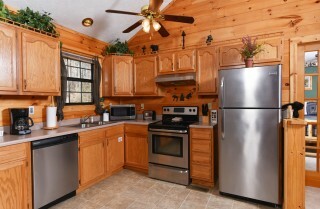 The new stainless steel appliances add to the look of the kitchen to give it a smooth, modern feel. 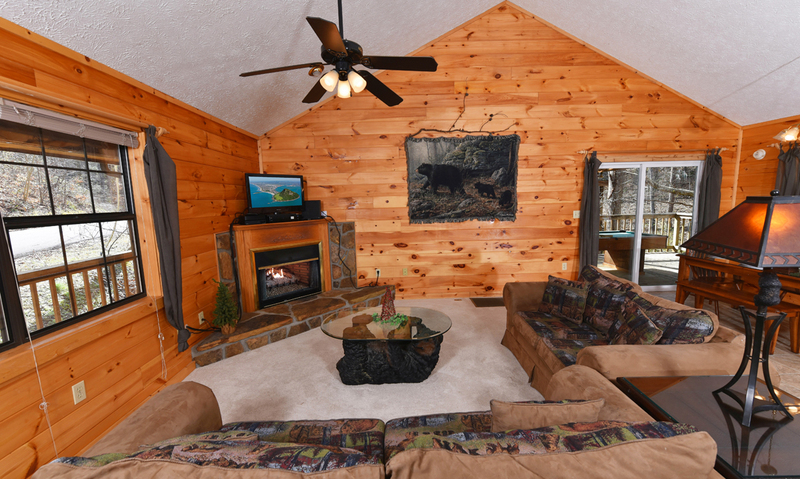 There are many amenities offered with this cabin that will enhance your stay. In the kitchen you will find a full-size refrigerator, a stove/oven, a dishwasher, coffee maker, microwave, and a large sink. Stepping outside of Mountain Blessing onto the back deck you will find the pool table. There is a view of the woods that you can admire as you play pool. You will like playing games outside in the fresh air! Outside on the back deck you will find a gas grill waiting for you! 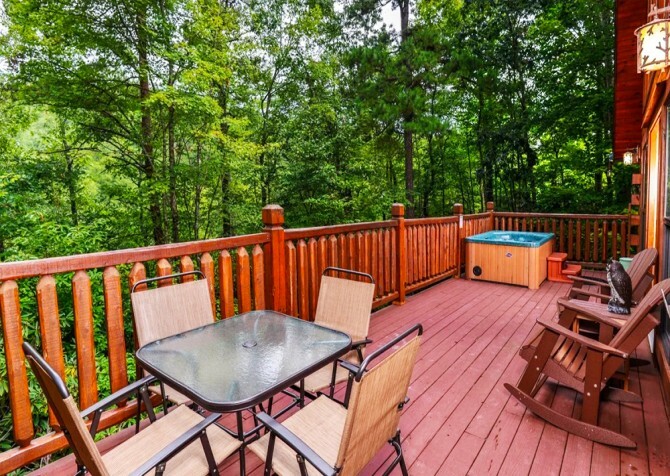 Fire up the grill on a warm day and experience the peace and quiet of the Smoky Mountains. 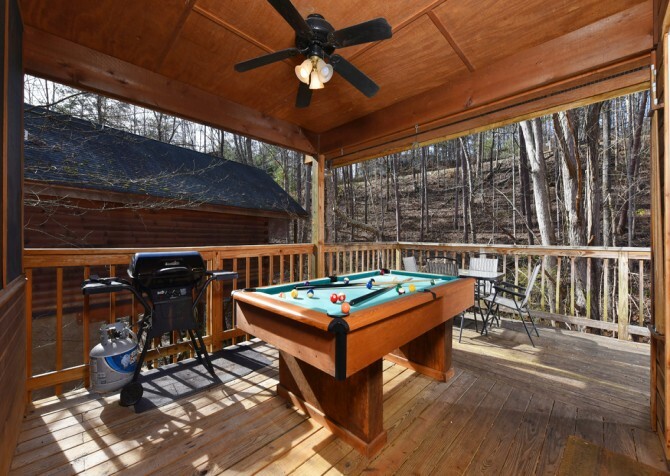 Mountain Blessing has an open deck that provides plenty of space for any sort of outdoor activity you could think of. 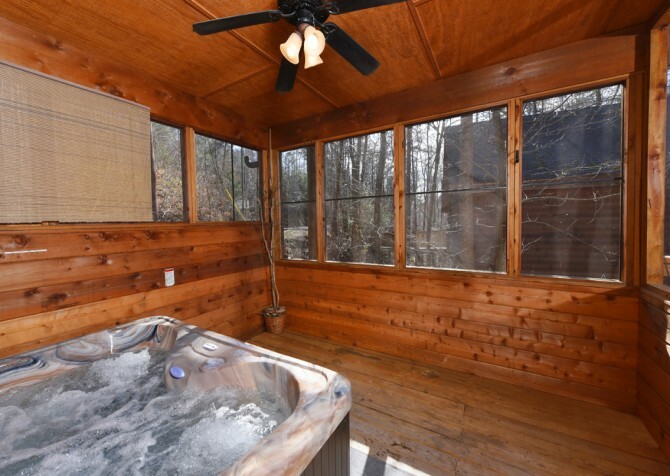 There is a hot tub in the covered section of the deck so that you can relax while also being blocked from the elements. 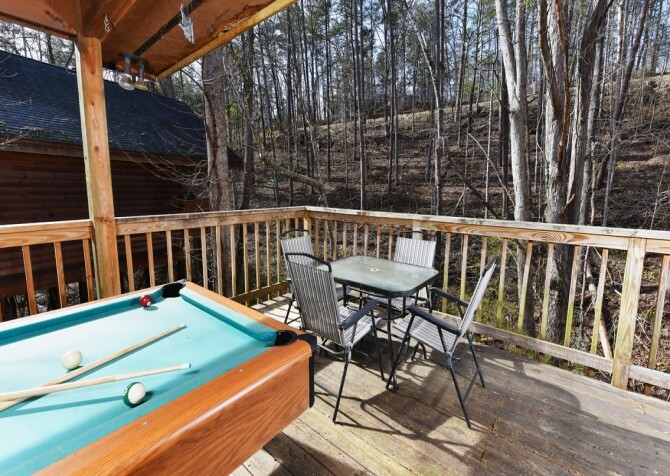 If sightseeing is something that you are interested in, there are a few options of popular attractions located near your cabin. 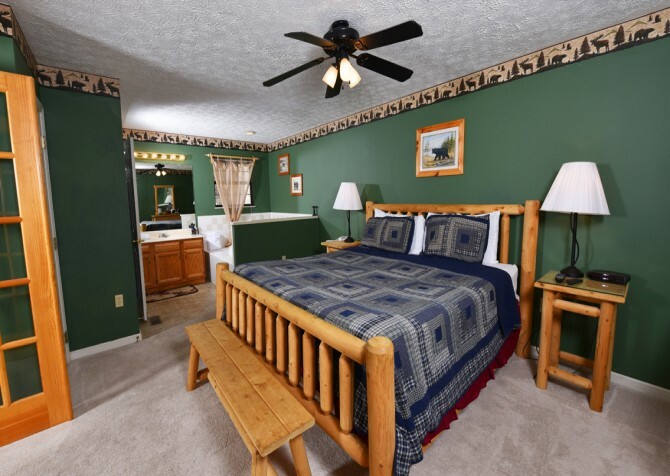 Less than four miles from your rental is the area of downtown Pigeon Forge! Join in the hustle and bustle of city life while you enjoy all that surrounds you. The famous Dolly Parton's Stampede is only six miles from Mountain Blessing. With such a famous attraction nearby, you are sure to stay entertained. 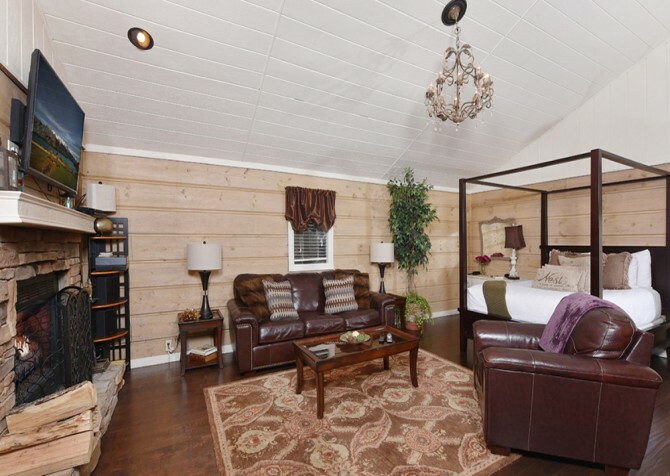 If shopping is what you seek, the Tanger Outlets are close to your cozy Pigeon Forge cabin. Along the Parkway, dozens of local shops offer unique gifts, including accessories, leather goods, wood carvings, dolls, knives, and art. 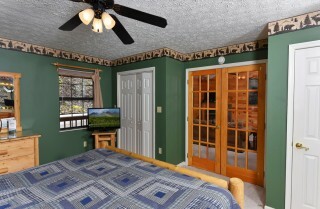 The famous Dollywood Theme Park is also nearby, offering families an entire day of fun! 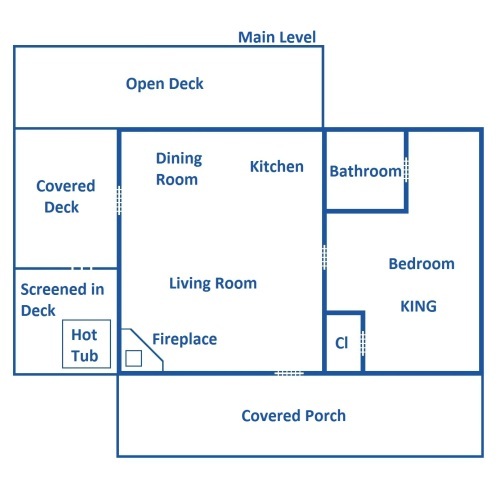 If you have any questions concerning pricing or availability, call us today at 866-513-7885! We have dedicated reservation specialists waiting to take your call. Let us help you book your dream vacation today! "I was in awe when I arrived. 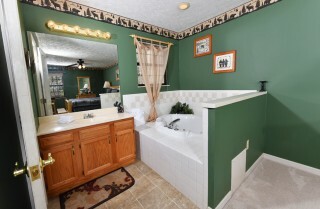 Beautiful and clean!" Thank you so much for this kind review! We are so glad to hear you enjoyed the cabin! "We had such a beautiful time. 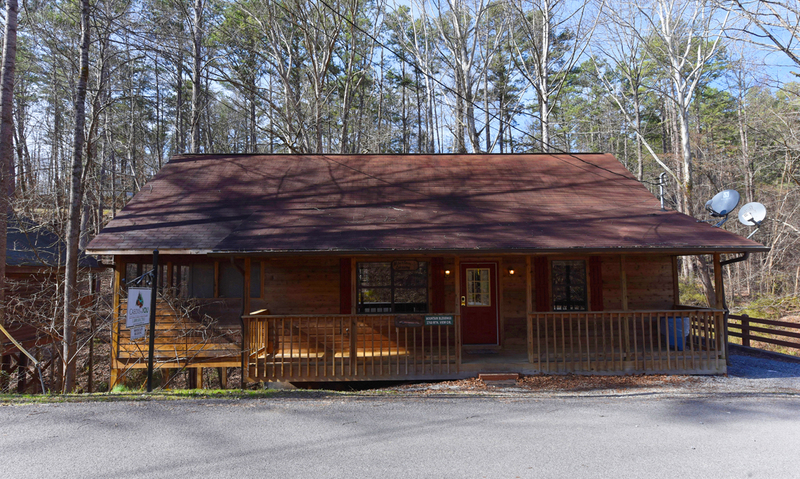 The cabin was so quaint, clean, and just lovely. 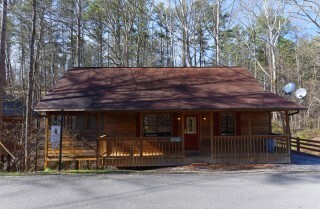 It was definitely one of the best places that we have stayed. The cabin was located in such a peaceful area, and we enjoyed the beauty of nature that surrounded the area. The check-in and check-out process was fast and simple. We absolutely loved it!" "The cabin was awesome!!! 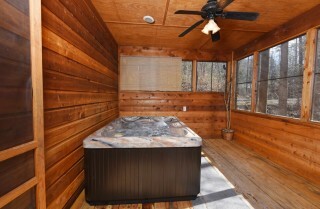 The pictures do no justice, it was very roomy and comfortable. I would recommend this place highly to anyone. I plan on using this company again. 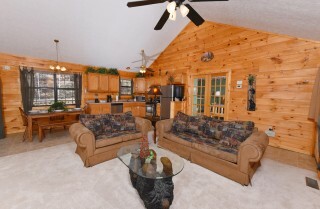 Not to mention, the location was very convenient, had no trouble finding the cabin what so ever! 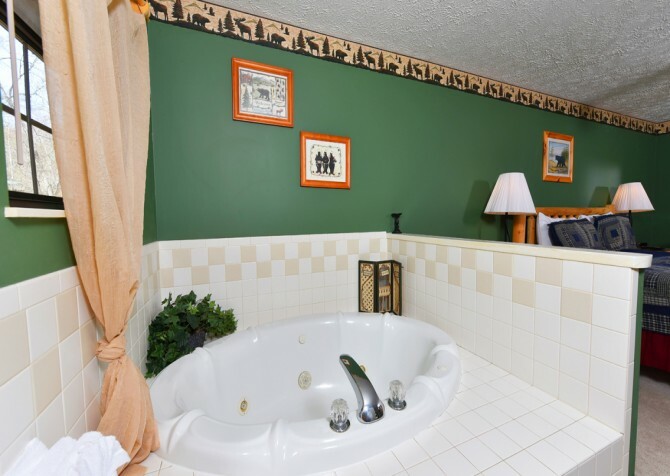 Look forward to my next stay!"